The surprise success of a Chinese sci-fi blockbuster over Lunar New Year has been tainted by rampant online piracy. “The Wandering Earth,” a movie adapted from a short story by the first Asian winner of the Hugo Award, Chinese novelist Liu Cixin, was the top grossing movie for the weeklong holiday, a coveted period for the Chinese movie industry. It had taken more than 2 billion yuan ($296.4 million) by Sunday, according to online ticketing platform Maoyan, making it arguably the most successful Chinese sci-fi film ever. But the director of the movie, Frant Gwo, said he had no time to celebrate his success because his team was busy dealing with the pirated copies that could be found all over China’s top e-commerce websites. 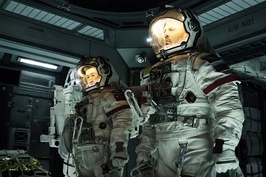 Downloadable copies of eight Chinese productions timed for the Spring Festival break, including “The Wandering Earth,” were still available on Alibaba Group Holding Ltd.’s Taobao on Monday. Some sellers bundled the eight into a single package and sold it for as little as 2 yuan ($0.30), while others boasted about the high definition of their versions. He estimated that pirated versions of the eight films had been viewed online 20 million times during the holiday break, Chinese-language version of the Wall Street Journal reported. Chinese cinemas kicked off the Year of the Pig with record-setting box office receipts of nearly 1.44 billion yuan ($213 million) on Tuesday, the first day of the Lunar New Year, beating last year’s milestone of 1.27 billion yuan on the same day. “The Wandering Earth,” with a reported budget of $50 million and a crew of more than 7,000, takes place in a distant future in which the sun is about to expand into red giant and devour the Earth. Amid the looming peril, engineers from the world scramble to devise a plan to move the planet into a new solar system using giant thrusters. Things take a turn for the worse when Earth nears Jupiter, sparking a desperate mission to save humanity from extinction. China’s first space blockbuster opened Tuesday “amid grandiose expectations that it will represent the dawning of a new era in Chinese filmmaking,” the New York Times reported. According to Niu Hongying, a journalism and mass communications professor at Shaanxi Normal University in Northwest China, Chinese audiences have been eagerly anticipating movie or TV productions adapted from works by writer Liu. The release date of the TV adaptation of Liu’s acclaimed fiction series, “The Three-Body Problem,” has been postponed indefinitely since the production wrapped up in 2015. No reason was given by the production house. Niu added that Wandering Earth lead actor Wu Jing has strong Chinese box office appeal. Wu’s 2017 action film “Wolf Warrior 2,” which he directed and acted in, was the first non-Hollywood release ever to make the top 100 all-time biggest-grossing films worldwide. 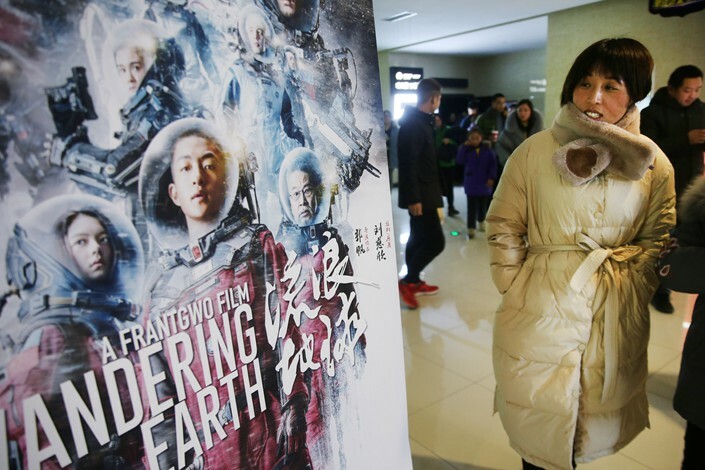 Lionel Fu, an analyst with industry tracker EntGroup, said “The Wandering Earth” helped fill the void of Chinese sci-fi movies, where the country has long trailed Hollywood. “The plot is creative, the special effects are brilliant, and word of mouth also contributed to the box office,” he told Caixin.